Nō wo tabi suru is a collection of pictures and articles previously published in the magazine Fujin gahō. The pictures portray Noh actor Umewaka Rokurō Genshō wearing costumes and masks of various characters from various Noh plays against the background of the places where the stories of the plays actually take place, for example the Goddess Benzaiten on the shore of Chikubushima Island on the Biwa lake for the play Chikubushima, or Rokujō no Miyasudokoro walking the characteristic paths among bamboo thickets in Arashiyama, Kyoto, for the play Nonomiya. This is an interesting book as it tries to visualise Noh character in real places, which is one of the beauties of Noh. I think it was Komparu Kunio who in his book Noh Theatre: Principles and Perspectives listed among the points of interest of Noh the possibility to learn about Japanese geography and to travel without moving, qualities that in Japan are characteristic of classic poetry. 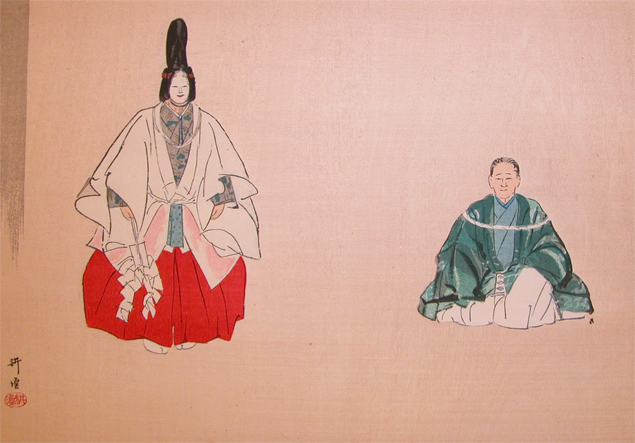 The pictures are truly beautiful and do an excellent service to the wonderful mask and costumes which I believe belong to the Umewaka Rokurō family. In my view the most striking shot is that of the character of the mother in the play Sumidagawa. I think the picture conveys the sense of estrangement the mother who travelled from Kyoto to Tokyo seeking for her lost child, must have felt. At the same time it reminds me that so many of the beautiful sceneries described in Noh are not that beautiful anymore.. The book closes with a chapter on the local food that Genshō and his companions had the chance to taste on their journey… a typically Japanese note that reminds me of the upper-class elderly woman which represent the target of this kind of publication. Sob. It is difficult to find words to illustrate what was meant to describe the indescribable. This is Sakura. A Tribute to Japan: an Italian project by Gio’ Fronti, directed by Alessandra Pescetta, and starring Monique Arnaud, a short film dedicated to the victims (dead and alive) of the Fukushima disaster. Arnaud, director of the International Noh Institute branch of Milan is the only Noh shihan (licensed instructor) to be currently active in Europe as teacher and performer. Her dance in the video is inspired by Noh movements, and she wears a costume realised by disassembling 10 paper tracksuits that recall those worn in contaminated areas, and by sewing them together into a Noh-inspired costume. The voice (in Japanese, subbed in Italian) describes the dreadful coming of the tsunami, when the clouds fell into the ocean, and the sky was left empty. But with the wind comes the beauty of cherry blossoms… Please click on the picture below to watch the video on Vimeo (I could not embed). Sakura. Tribute To Japan from videodrome-XL on Vimeo. Tomorrow I am embarking on a new journey to Japan. After I began to practice Noh theatre I went back to Japan almost every spring in order to undertake training with Udaka Michishige in Kyoto. For someone like me, coming from a non-Japanese studies background, it is rather hard to find opportunities to go to Japan and study there. So far I always managed with travel grants and research funding. This year will be my first experience as ‘official’ exchange student at Ritsumeikan University in Kyoto. Among the choices were Waseda and Keio – with all due respect, the exchange programme committee was a bit surprised to see that my first choice was Rits. However Kyoto is the city I love and the headquarters of Udaka-sensei’s International Noh Institute. I am going to stay there until September, entering then my 4th and final PhD year at Royal Holloway. This time in Kyoto is going to be very special. On 12 June 2010 I will take my first role as actor in a full Noh theatre performance, Makiginu, as companion of the main actor, or shite-tsure. The shite role will be taken by Monique Arnaud, advanced student of Udaka Michishige and licensed instructor of Noh (shihan). While this tsure is a rather static role, its function is primarily centred on the chant. As he opens the performance singing a rather long chant section, his responsibility is setting the mood of the play. I will post more information about this event as my training progresses. The other reason that makes this performance particularly special for me is being on stage with Monique Arnaud, who has taught me Noh theatre while I was living in Italy. If I have a chance to be performing on a Noh stage today, I owe it to Monique-sensei. I will write more about her later on. As for now, wish me good luck.